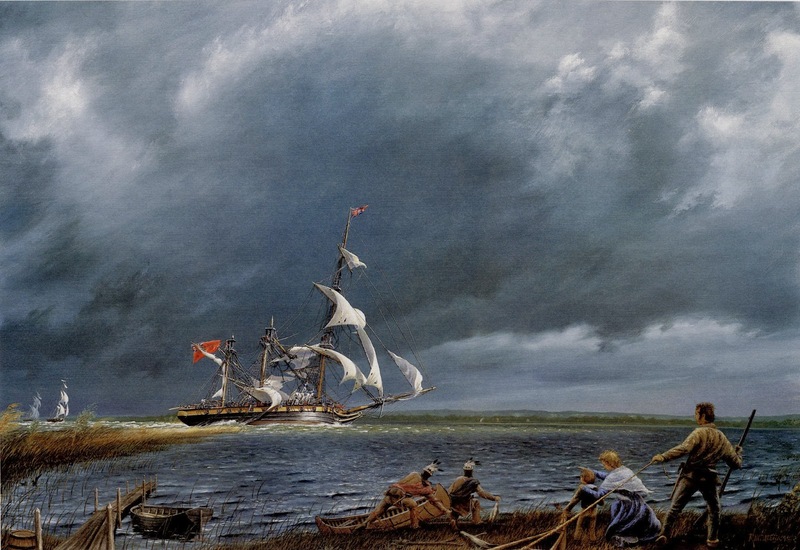 I am off to the interior, in effect to complete the trip to Amherstburg shipyard that I began nearly a month ago, but this time, to do it entirely overland as the sea route is occupied by the US Navy’s Lake Erie Squadron. 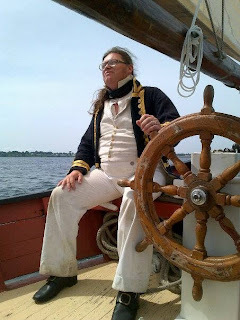 I am detailed to salvage what is possible from the yard and bring it back to Burlington where the Commodore will decide whether to begin the process of creating another shipyard to build a new squadron on the upper lakes, or use it to enhance and re-enforce the Lake Ontario Squadron. And it is certainly necessary to do the latter as we have had another encounter with US Commodore Chauncey and his fleet. I will now tell you the story.. Repairs had been effected on the squadron after the encounter with Commodore Isaac Chauncey off of the River Genesee on the 11th where a calm had nearly done for them. The Americans had the weather gauge but the light wind did not allow them to maneuver quickly. With the US schooners using sweeps in an attempt to close, Commodore Sir James Yeo towed his squadron using ships’ boats and kept the distance to long cannon shot where only the long guns could be effectively employed. 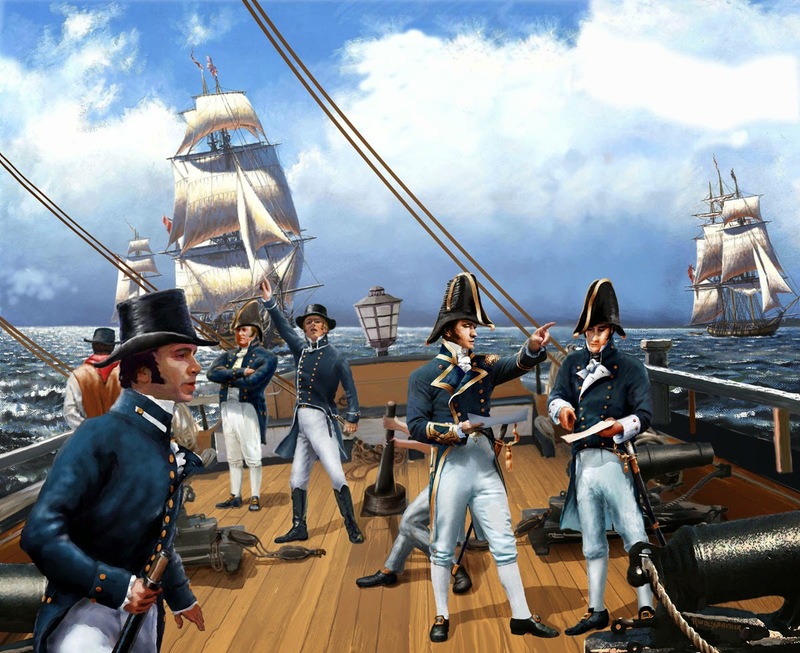 Eventually, a breeze came up and Sir James was able to sail the Squadron away from the trap against the US shore and made his way back to Kingston. It was at this time that Sir James decided he would only battle Chauncey when there was sufficient wind to close and render our carronades effective. At 6 AM on the 28th of September, in rising north easterly wind south west of York, the American squadron was sighted about 12 miles southeast of us. Sir James’ flagship is the ship-sloop HMS Wolfe, rated 22 and equipped with 18-32 pdr carronades, 2-68 pdr carronades and 2-12 pdr long guns. She’s almost 6 feet longer than the George and somewhat faster. Royal George was second in line followed by brig Lord Melville (14), 72 feet on deck, sloop Earl of Moira (16), 71 feet on deck, schooner Lord Beresford (12), 73 feet on deck and the schooner Sir Sydney Smith (12). The squadron turned north east by north to try to take the weather gauge but could not weather Gibraltar Point so tacked, and headed south, still in line of battle. Chauncey, also in line ahead and heading north, then wore around and headed south by west on a slowly converging course. The flagship of the American Squadron is the corvette General Pike (26), 145 feet between perpendiculars, making it bigger than all of the US 32 gun frigates and even the 36 gun USS New York! That, coupled with her battery of 24 pdr long guns make her a difficult opponent. She was hampered however, by having to tow the schooner Asp (3) into action. Following Pike and Asp was the schooner Sylph (10) towing schooner Ontario (2) then followed by ship-sloop Madison (24) towing schooner Fair American (2). Madison is the second largest of the American vessels and is112 feet between perpendiculars, making her larger than Wolfe. After Fair American came the brig Oneida (18), and schooners Governor Tompkins (6), Conquest (3) and Pert (3). We carried on in this southerly course until one bell in the afternoon watch, when Sir James ordered the squadron to tack in succession. We had speculated on what the Commodore would do as it appeared Chauncey was aiming to cut off the smaller vessels at the rear of our line. It may be that the American Commodore surmised that we were about the same objective for he then wore ship and had Pike (still towing Asp) on a course to intercept Wolfe to protect the rear of his line. By two bells, the flagships were within cannon shot and Wolfe opened fire. Pike continued to close the distance, apparently disregarding Wolfe’s cannonade then turned almost parallel and let fly with her 24 pdrs. Wolfe seemed to shudder under Pike’s broadside, but firmed up her course and sent another at the Americans. Pike’s main topgallant mast was damaged and came down onto the main topsail. This visible effect of the Wolfe’s fire raised our spirits considerably as the terrifying broadsides of the Pike were felt to be a winning factor. However, this elation lasted but a moment. Another pair of broadsides were exchanged and the very thing that had been feared occurred. Wolfe’s mizzen topmast stays were cut, the unsupported mast pressed forward on to the main topmast and took it down and over the side, splitting the main yard at the same time. With only the headsails and the foremast sails drawing, Wolfe became unmanageable and turned away from the wind of her own accord. It appeared that Chauncey viewed this as the opportunity for victory and again turned Pike downwind to pursue Yeo’s crippled ship. Our other vessels had struggled to keep up with the racing Wolfe as best we may and were now close at hand. 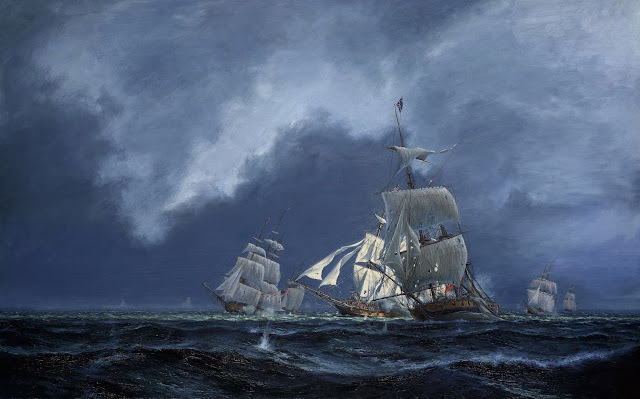 As Wolfe spun about and began to head downwind it meant the George now led the line and Commander Mulcaster brought the sloop directly into Pike’s path, backed the foresail to slow her to a virtual stop, then fired the starboard broadside into Pike’s bows. While the short range carronades of Royal George had thus far been of little use, now they came into their own as the crew reloaded quickly and fired again and again. 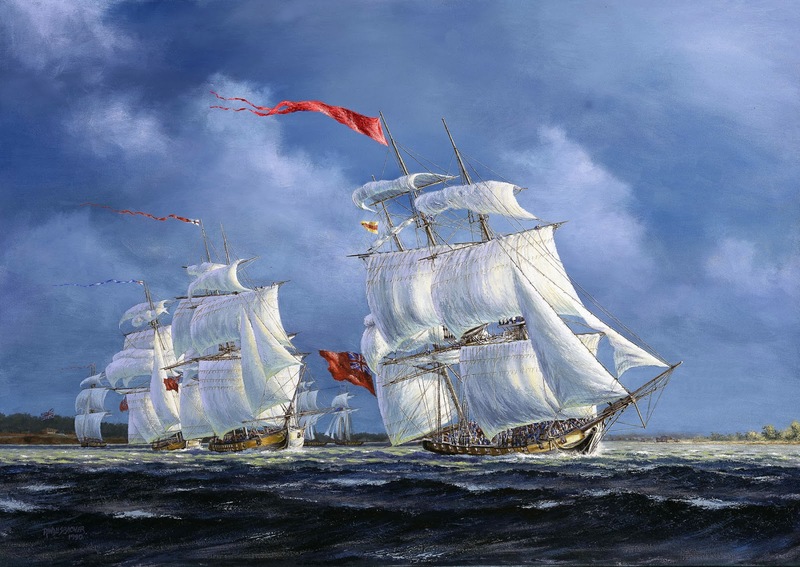 After a few unanswered broadsides from the George, Chauncey turned his ship away to bring his own broadside to bear and again the 24 pdrs of the Pike played upon our fleet. By now however, the Melville and the Moira had come up and were able to play in their turn upon the Pike. 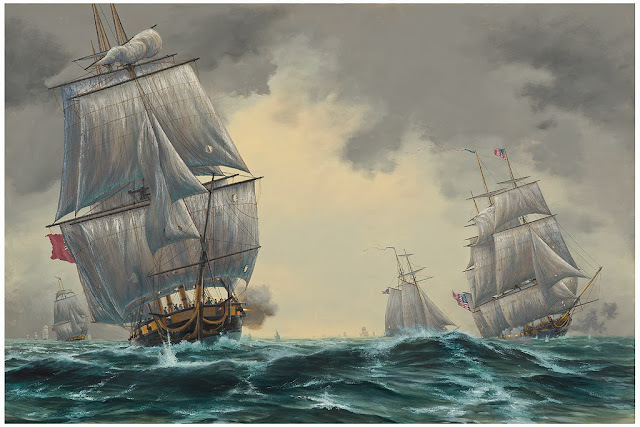 The other lead American vessels were hampered in their movement by having to tow the schooners and while they did add their fire, it proved to be ineffective as our vessels could maneuver out of harm’s way. After about a quarter of an hour, the Wolfe was again under control although she could not sail upwind and Sir James then turned south west towards the anchorage at Burlington Bay while the squadron turned to follow in her wake, the George covering the rear of the squadron. Commodore Chauncey, rather than cast off the tows and get in amongst the vessels of our squadron, elected to keep the slow schooners with him and followed as best he could. Only Pike was close enough to maintain fire at our fleet but there were no more decisive hits and, at about six bells, we came into the anchorage. By now, the wind had risen to a full gale and, perhaps feeling he was on a lee shore with hostile forces around, the American Commodore wheeled his squadron about and bore away southeast towards Niagara. It is well he did, I believe, because within the hour, a military detachment from Burlington Heights was erecting a protective shore battery. Fortunately, our anchors held firm and repairs to the damaged vessels commenced. It was then I was put ashore to commence my mission to Amherstburg. 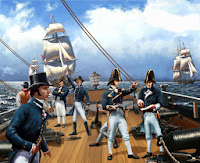 I am saddened by the need to leave the Squadron, and in our inferiority to the enemy in big ships, numbers of men and size of guns, but heartened by the spirit in which the battle was fought, and the obvious superiority of our vessels over the enemy in co-operating with each other for mutual support. It is the one factor that allowed us to survive this encounter. I leave you now to commence my plunge into the interior and endeavor to negotiate the goat paths and tracks that pass here for roads. I wish you the best of good fortune, Sir. Peter Rindlisbacher's paintings used with special permission from the artist.